Environmental issues are a human rights issue. No matter where you stand on the scale of being a treehugger, I have faith that you will recognize when a crime against humanity writes itself and in cases such as these, the environment is merely a victim too, so we need to fight this fight together. I want to use the example of Sterlite Copper to further drive this point home. You see, Sterlite Copper is a copper smelting process plant operating out of Tamil Nadu, India. In fact, Sterlite was on its way to becoming the world’s largest single location copper smelter in an urban area, if their expansion plans went through (it didn’t). They’ve recently gained a lot of media attention due to the company’s neglect on not only the environment but also those living in the surrounding areas of its process plant. Sterlite has a history of red flags and I am starting to wonder that maybe we need stronger legislation and intervention to prevent cases such as these from re-occurring. Sterlite used to operate in Maharashtra in the early 90s but were chased out following protests from locals. Sterlite is familiar with the face of rejection as they were previously disdained by Gujarat and Goa until Tamil Nadu welcomed their project in 1994. Since then, a slew of complaints from neighbouring businesses and residents were collected for over a decade: headaches, coughing, nausea, breathlessness, respiratory tract infections, wheezing, eye irritation and miscarriages. Though Sterlite denies these claims are related to its plant, it is hard to believe they didn’t contribute to the withering health and environmental conditions of the surrounding area. Sulfur dioxide is a gas generated in the copper smelting process, and has been linked to asthma and other lung concerns. In 1997, over 100 women working at a nearby dry flower factory fainted and were even hospitalized for up to five days as a result of a high concentration of SO2. Just weeks later, employees of a station close by to Sterlite reported vomiting and nausea. Rinse and repeat and the year is now 2013 and panic had spread widely in the residential community of Thoothukudi who all shared symptoms of irritation and burning one morning. Further stack testing later proved SO2 levels had shot up to 235% of the permissible levels! 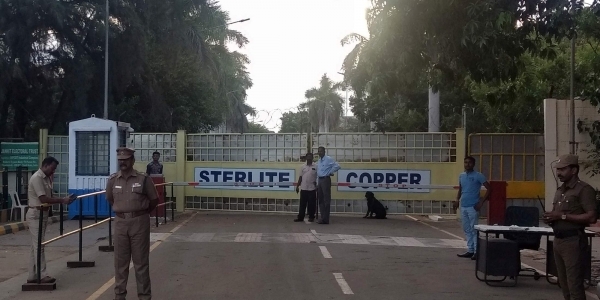 The Tamil Nadu Pollution Control Board (TNPCB) also calculated that strong winds from the direction of the plant prove Sterlite to be the culprit and though this was not convincing to everyone (I.e. Sterlite), it should not be entirely dismissed. In a publication by the U.S. Congress on the Environmental Aspects of Copper Production, it suggests there are potential impacts on surface and groundwater quality during copper production. 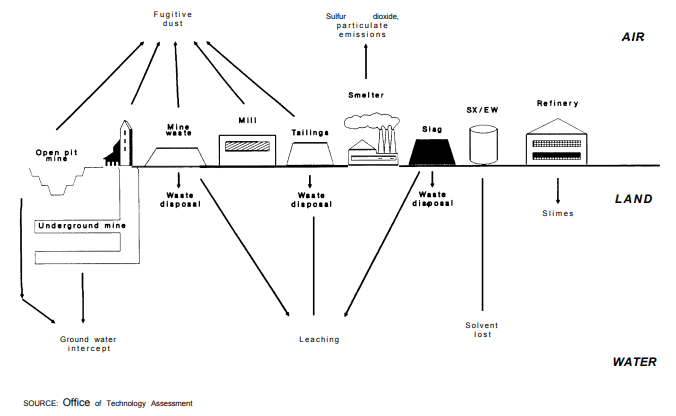 This is indicated in Figure 1 which identifies prospective contaminants to land, air and water from a copper process plant. The impacts of Sterlite’s leaching are observed by farmers who face barren land as consequences of the chemically tainted land. In addition to health risks, Sterlite’s negligent actions are costing the livelihood of farmers who can no longer grow their crops on unforgiving soil. Police amidst crowd of protesters surpassing their 100th day. This is just scratching the surface on the atrocities committed by Sterlite during its presence in Tamil Nadu. The Anti-Sterlite movement recently gained its traction when the company announced its intention to expand their unit and double their production. The backlash caused by this decision is recorded by the hundreds who showed up to (peacefully) protest through means of sit-ins and strikes. In Sterlite’s most recent death toll, 13 lives were claimed (and many more injured) when police opened fire on the crowd of protestors. Their lives were not lost in vain as shortly thereafter, the Government of Tamil Nadu issued permanent closure of the plant. Though this is a victory twenty years in the making, this experience comes bearing lessons. Despite evidence indicating the deteriorating health of the public, Sterlite continued to operate and grow its production. I cannot help but compare if this were to happen in Canada, Sterlite would be shut down and remedial actions would be administered promptly after evaluations were completed. In fact I can say this with confidence because this did happen. A sign by a water fountain in town hall during the E.Coli outbreak in Walkerton. In the spring of 2000, there was an E.Coli outbreak in the water wells in Walkerton, Ontario. Six died due to the lack of standard practices and testing completed by the town’s unqualified utility workers. Corrective actions followed the tragedy which included: identifying the source of contamination, handing over clean-up responsibility to Ontario Clean Water Agency and introducing new policies and legislations. Since then, there have been no severe incidents of water contamination in wells. The right people were held accountable for their actions and proactive measures were enforced to prevent this incident from repeating itself. So why did it take over 20 years before Sterlite was shut down? The answer to this may be a bit past my purview but I strongly feel there should have been measures taken earlier on which would have averted the fatal outcomes. I hope to see India take a page from Canada’s book and implement environmental legislation with stricter policies so hazards are recognized as early as possible. I think accountability is key and to ensure this, operating licenses should outline the exact limitations of emissions which must be maintained. In the event these emissions are exceeded, corporations such as Sterlite must pay its fine for its inadvertence. Regular environmental audits in addition to soil and groundwater monitoring and stack testing are just a few solutions which protect the citizens and the environment. In my hope for the state’s future, I want to see agencies such as TNPCB receive more authority to reign over industry compliance requirements. Protesters make a stand against Sterlite Copper. Tamil Nadu government failed its own people for letting this persist for as long as it did but the collaborative efforts of the community to uprise and summon against a conglomerate such as Sterlite gives me hope for the sustainable future of the state. It makes me hopeful to hear of the environmental awareness Sterlite has stirred and it paves the way for sustainable development in business practices. This instance not only demands stricter protocols for businesses but it brings attention to unethical practices which are not tolerated by an informed public. The solidarity expressed by Tamil Nadu citizens and its political parties shows we are moving in the right direction. With this said, I am rooting for my home state to develop and progress towards a future which is considerate of the wellbeing of its citizens and the conservation of the environment.